I am SOOO excited about this new feature I am working on called Sweet Twooth! I hate wasting food and sometimes my husband and I just crave enough for a few bites, so I had a brilliant idea What if I can satisfy cravings for two? 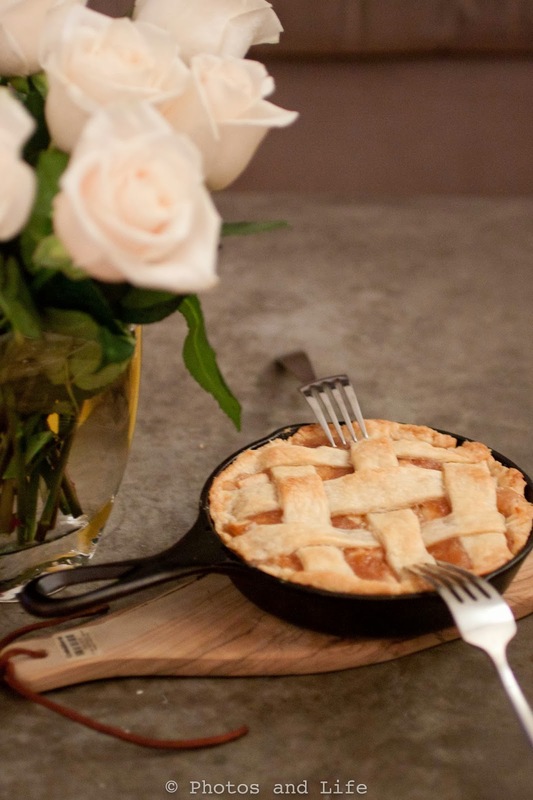 and What if I can make everything in a gorgeous tiny tiny cast iron skillet? Sweet Twooth was born. Its no secret that I have a minor obsession with kitchen items. I have made it a point to surround my kitchen with gadgets I love (hello Le Creuset Obsession). While I was at my favorite kitchen store a few weeks ago I found this gorgeous Lodge 6 1/2 inch skillet stashed away in the corner. I knew I HAD to have one and picked it up for $11.99 (hello great deal). This blank canvas felt so raw and I felt such endless cooking possibilities. I have scoured the web for small recipes and have found a few good sites but nothing that had my point of view of healthy and just for two! This particular recipe is light/fluffy pie crust with oohy gooey apple filling. I am actually quite proud of myself for bringing the concept of this pie to life on the first try. 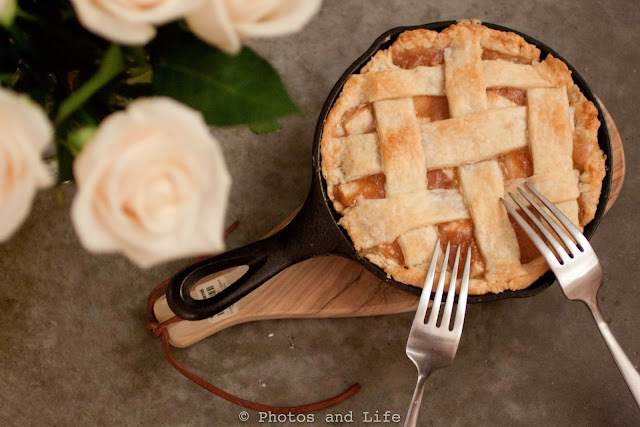 I admittedly am not a huge fan of pie. 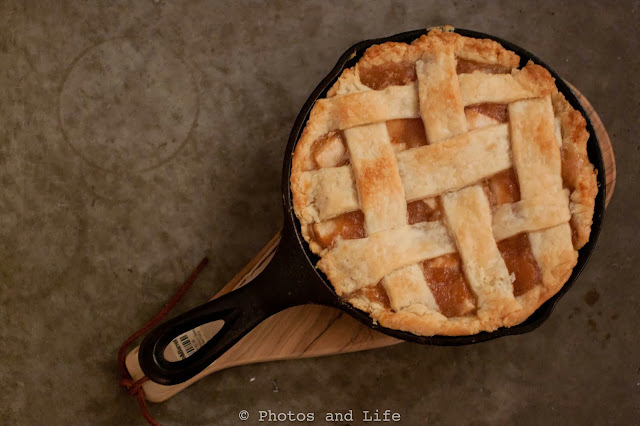 I'm not 100% sure why, but its just not my go to dessert, however the thought of depriving this gorgeous little skillet of pie was horrifying to me (and we went apple picking this past weekend). 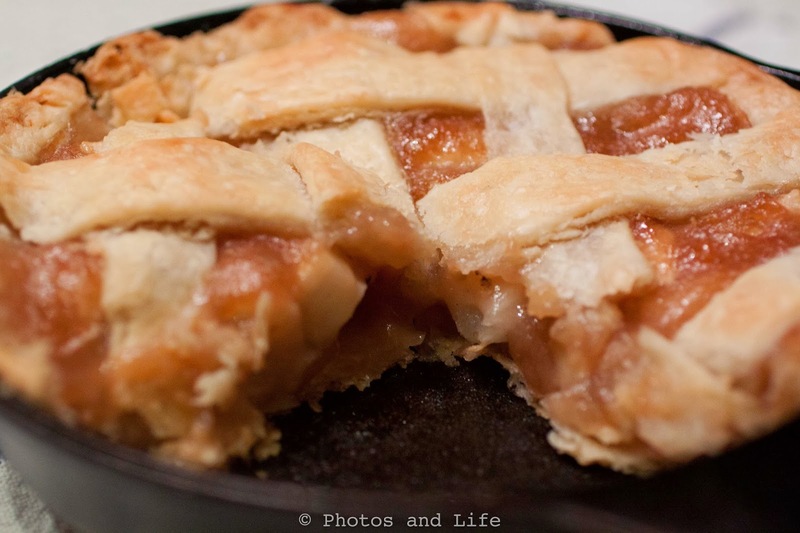 When I think of my favorite parts of the pie its the gooey parts mixed with the crust, so first on my list was to equalize the apple chunks and the gooey texture as much as possible. Normally the gooey parts (do you love how much I have typed the word gooey in this post) are copious amounts of butter mixed with a apple juices as the pie cooks. Instead of butter I decided to mix the apple chunks with a good helping of homemade cinnamon apple sauce. Let me tell you that you WILL NOT miss the butter and will LOVE the texture of the small apple chunks mixed with the apple sauce. I hope you enjoy this recipe and this new feature - I am really excited to share it with the world! Enjoy (if you are not that hungry or just want a small taste you can cut into 4 pieces, you can also cut in half an enjoy just two pieces or if you are really hungry just eat the whole thing)!